Portland Police, Multnomah County Sheriff's Office respond, leading to arrest of Xaire Johnson. 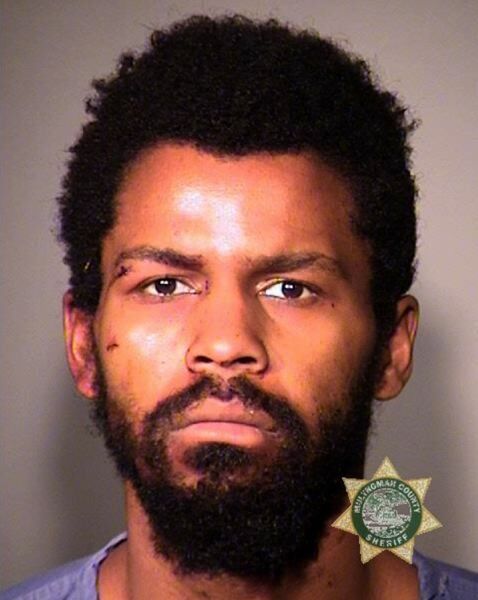 A Portland man has been jailed after police say he stabbed three adults during a "dispute over property." Portland Police responded to a greenspace near Northeast 102nd Avenue and Interstate 84 around 7:20 p.m. on Friday, Jan. 18 after recieving reports of a stabbing, according to a news release. Officers found three adults who had suffered "serious but not life-threatening injuries," who were transported to a hospital. A Portland K-9 unit located a suspect nearby, who was later identified as 26-year-old Xaire Lamont Darn Johnson. He was also taken to the hospital for treatment of serious, non-life-threatening injuries. Police say all four adults were "local transients" who apparently were arguing about ownership of certain belongings. Officers realized they were technically inside Maywood Park — a tiny independent city surrounded by Portland — and thus the investigation was transferred to the Multnomah County Sheriff's Office, who provide law enforcement services to the town. Detectives continued to process the crime scene until 11:30 p.m.
Johnson faces three counts of first-degree assault, three counts of second-degree assault and three counts of unlawful use of a weapon, police say. He was convicted of fourth-degree assault and menacing in 2013, according to court records. "This investigation is on-going and additional charges may be filed at a later date," deputies say. They continued: "The Multnomah County Sheriff's Office wishes to thank the Portland Police Bureau for the assistance they provided during the initial response to this investigation. PPB's quick response led to the swift apprehension of Johnson and assured that no one else was injured."